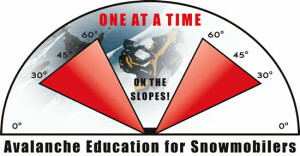 Welcome to the Avalanche Education Repository for Snowmobile Educators. Avalanches have injured or killed a growing number of snowmobilers over the past decade. But since most avalanche accidents can be avoided with simple education and preparation, it is increasingly important to teach snowmobilers about avalanches, how they can make informed decisions, and how to travel more safely when they are snowmobiling in avalanche terrain. Riders are increasingly pursuing challenges and fun on the slopes – but they need more education to help them respect avalanche terrain and make better decisions so they return home safe and uninjured. This Education Repository has been assembled by IASA with financial assistance from the Recreational Trails Program administered by the U.S. Department of Transportation Federal Highway Administration (FHWA) with the purpose of – to the extent possible – providing a ‘one-stop’ source of information to help professional educators build local programs for educating snowmobilers about recreating in avalanche terrain. The categories below provide links to avalanche education information which is provided by a wide range of avalanche agencies and professionals. Or visitAvalanche.org which is the gateway to most avalanche-related information on the web. Sources of information for local avalanche forecasts, educational classes, statistics, and general avalanche information. Avalanche.org is the gateway to all avalanche centers worldwide. Links to on-line avalanche education lessons and information. These tutorials incorporate reading, tests, and/or videos to provide a wide variety of interactive learning opportunities – for beginners to advanced winter recreationists. A wide selection of web-based educational information and avalanche training materials. A range of information regarding avalanche accidents and incidents from the worldwide, national, and local perspectives. A variety of photos available on-line showing avalanche incidents from several areas. On-line video clips of avalanche incidents. Education course handouts, outlines, and guidelines from a variety of training providers. Power Point training programs available for downloading. Avalanche educational graphics, posters, photos, and movie clips available for downloading. Supplemental reading and reference materials that is available on-line. Supplemental training videos available for purchase. Supplemental reading and reference materials available for purchase. Search avalanche educational training classes by state or province at Avalanche.org.